Should you be unfortunate enough to have squirrels gaining access to your property then we recommend that you engage in a squirrel control and removal treatment process as soon as possible. Problems with Squirrels can quickly escalate as, on average, they can have up to two litters a year with each litter containing up to four kits. This means that within one year they can cause a tremendous amount of damage to your property as each squirrel will gnaw on a daily basis. Grey squirrels were deliberately introduced to Britain from North America in 1876. They were considered fashionable additions to large estates. Since then they have spread throughout most of the UK pushing the native Red Squirrels to near extinction. Grey squirrels are generally very active during the daytime when they spend their time foraging for food in trees and on the ground. During Autumn they are perhaps at their most active when they are busy storing nuts ready to eat during winter. 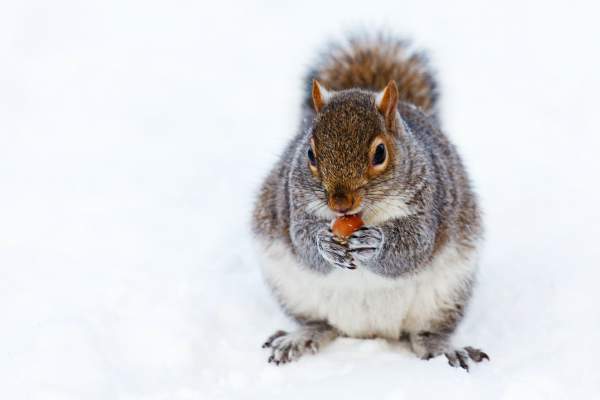 They will generally bury their nuts in scattered hiding places or “caches” not far from their nests. You may see them attempting to bury nuts or seeds in your gardens from late summer to early winter. They have developed an excellent spatial memory and acute sense of smell that allows them to track down these hiding places weeks or even months after burying. Grey squirrels typically breed once or twice a year depending on the availability of food. They will have between 1 and 4 young in each litter. In woodland grey squirrels will build their nests or ‘dreys’ in tree branches or hollow trunks. However, they are happy anywhere that is warm and dry and loft spaces and chimneys make perfect locations. The main issues caused by grey squirrels are as a result of their gnawing. As with rats, squirrels have incisor teeth that are constantly growing. To file them down they will gnaw on all sorts of different objects including wood, metal and plastics. When squirrels get into a loft there are lots of materials for them to pick from including wooden beams and electrical wires. If squirrels have been in your loft then it’s best to be very cautious when entering the space. Supportive wooden beams may have been gnawed through making them weak and dangerous. Electrical cables could have been exposed as plastic sheathes have been chewed off. In fact, it is not uncommon for squirrels to cause house fires by gnawing on electrical wires. Sound – The biggest giveaway to a squirrel problem is noise coming from your loft. Squirrels are larger than rats or mice and their scampering can be heard quite clearly when they are active. They tend to sleep at night and move around during the day especially during early mornings and late afternoon. Smell – Over time the smell of urine will become quite strong especially if there are a number of squirrels in the nest. Track Spotting – Depending on where their main entry point to your property is you may be able to lay down some cardboard and sprinkle flour over it. When the squirrel walks over the cardboard they will leave paw prints. Squirrels don’t walk as a mouse or rat would, instead they “bound” which means their rear paws come up alongside their front paws. Their front paws have 4 toes and are relatively small whereas the rear paws have 5 toes and are larger. Nests – Squirrel nests are fairly large with a loose, messy construction. They will be built with whatever materials are available including wood, grass, moss and leaves. If the nest is in your loft they may well use insulation, paper or whatever else they find that is soft and comfy. Droppings – Many rodent droppings look very similar so identification can be tricky unless you’re an expert. Squirrels tend to produce oblong shaped droppings which are dark brown. They are approximately the same size and shape as a raisin. Squirrels are problem solvers and extremely adept at finding any weakness in a home to gain entry. To prevent squirrels entering your loft space all holes need to be blocked, even very small ones. Should they gain entry there are a few tricks that homeowners can try to get rid of them before they establish themselves. Scent Repellent – These work by giving off a powerful odour that is meant to resemble a predator. In all honesty, they have very mixed results but they may put the squirrels off for a short time allowing you to block entry points. Ultrasonic Noise – As with the above, results are mixed, and the squirrels will generally get used to the noise quickly and simply ignore it. Strobe Lighting – The more powerful the better as the idea is to make the loft space an unappealing place to live and force the squirrels to leave. Should the above fail then we recommend contacting a pest control expert who can assess the situation and provide a solution to remove the squirrels. If you think that you have a problem with Squirrels then get in touch with us for a free, no obligation quote.